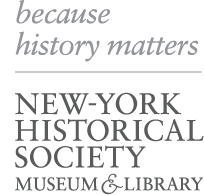 When you think of the New-York Historical Society, you may imagine exhibitions about the Founding Fathers, or programs about the Civil War. Or maybe you picture the rare colonial-era books and documents in our research Library, or our spectacular collection of Tiffany lamps. We’re proud of all of these exhibitions, programs and resources. But history doesn’t end with the 19th century. Our latest exhibition, titled Silicon City, begins with an event that was an unforgettable part of my own life—the 1964 New York World’s Fair. Back then, of course, it never occurred to us that the Fair would be history. If anything, we thought it was revealing the future. Taking my first excursion on public transportation without parents or older siblings, I ventured with my friends to the fairgrounds in Flushing Meadows Park, where we thrilled to enter the majestic, ovoid building, known as “The Egg,” that architect Eero Saarinen had designed as the IBM Pavilion. And there, in a crowd that had flocked to the Fair from around the United States and the world, we first glimpsed the possibility that a Computer Age was coming and would affect how we all lived. For the opening, theatrical moment of our Silicon City exhibition, we have built a recreation of the IBM “Egg," to introduce our visitors to a pivotal moment in the history of computing. But, just as much as we want to point out that “the future” very quickly becomes history, we also want to remind our visitors that history is all too easily lost. Our goal in Silicon City is to revive awareness that New York played a central role in imagining, developing, and selling computer technology long before there was a Silicon Valley. All this was already accomplished fact by the time my friends and I entered the Egg in 1964. And so were developments in telecommunications networks—from Bell Labs’ first round-the-world phone call in 1935, to the launch of the first AT&T Telstar communications satellite in 1962—that would soon lead to the invention of the still-unimagined Internet. We don’t just want to tell our visitors about Telstar—because then it might seem to be just an outdated piece of technology from half a century ago. We want people to encounter Telstar as it was: an epoch-making innovation, which helped lead to the most up-to-date digital devices in their own lives. That’s why we intend to bring this piece of computer and telecommunications history right into our galleries—and we’re doing it, appropriately enough, through an Internet company founded in New York. It’s the final hours of the New-York Historical Society’s first Kickstarter campaign, an opportunity for the public to participate directly in Silicon City so they can see an original Telstar, close-up and in-person.